Hello, lovelies~ I know that it's cheesy to be saying the month just flew by so fast, but this is what I feel this month. It just felt really fast and now we're already heading to August. So, as usual, I am going to list the beauty items that I used ofttimes this month. I've talked about it in details HERE. Bottom line is it's absorbed rapidly and doesn't have a greasy finish after using it. Since my skin decided to behave badly at the beginning of the month and broke out everywhere, I skipped using retinoic acid for a while, turning my combination skin type into my old, usual oily skin type. In order to prevent excess oil piling on my face, I use this face wash instead of my Hada Labo. To encourage the keratinization process to occur normally, I tend to exfoliate everyday with a gentle method. My Konjac Sponge is perfect for days when I want a soft and gentle exfoliation process. Without parabens, this lip balm is able to moisturize my lips and relieve my chapped, cracked lips in an instant. It doesn't feel like it coats my lips, but it just sinks in my moisturize it. I bought this last month when it was on sale. I forgot how much I paid for it, but it was a good deal. The scent is more of a jasmine scent and also has a subtle sweet scent. Although I received the sample size from them, I can see the changes. I haven't made a full review on this product yet, but I will soon, so keep your eye on that! I love the practicality of this powder when I'm in a rush. I just take a powder brush, sweep on the powder foundation and lightly dust it evenly all over my face. I noticed that it eves out my skintone, minimizing the redness. 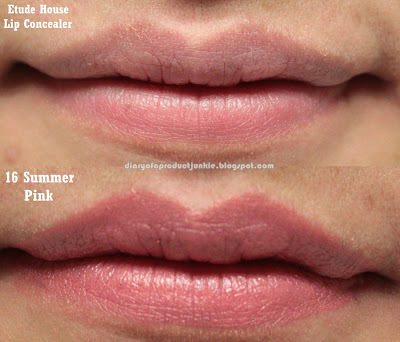 I've been into a pinky-peach lip color lately, just because it still looks natural, yet it has a slight brightening effect for my face. I love this lipstick because of its moisturizing property and pigmented colors. Do you like to watch my Youtube Videos?